Proposition 1: Good idea or bad idea? WOW…Aren’t we lucky in Texas to have all this ‘free money’ in our “Rainy Day Fund”? 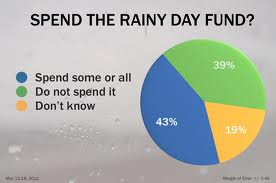 Whenever we have a pet project (important or not) that we cannot get funded through the legislative process, we can always propose a Constitutional amendment to raid the Economic Stabilization Fund (aka “Rainy Day Fund”). What’s that you say??? It’s not free money? Are you suggesting it is a Constitutionally protected pool of excess tax revenue that is set aside for true emergencies and natural disasters? Everyone I know agrees on the importance of issues like water, transportation, education …. If the solutions to these and other important issues was simple, there would be no concern or disagreement. If the question however, is how do we fund these programs, my instincts tell me the Economic Stabilization Fund may not be the answer. Some say we will never need all the Rainy Day money, that it will just sit there and benefit no one. Really? How do we know? The Texas Comptroller projected a possible surplus by 2015 of $8 billion in the Rainy Day Fund. Hurricane Ike alone was responsible for $29.5 billion in damage to Houston and Galveston. What if there are two maybe three Ike’s in our future? What other unforeseen emergencies or natural disasters are out there? What will be the impact of the deadly Ebola virus? What’s next? I believe expediency and wisdom are natural enemies. The Breitbart article below I believe is an excellent example of an attempt at political expediency. Who will be next in line with an outstretched hand for their share of this Rainy Day ‘easy money’? Even though it is often a difficult struggle to pass bills through the normal legislative process, is that not the intent of our Constitution? 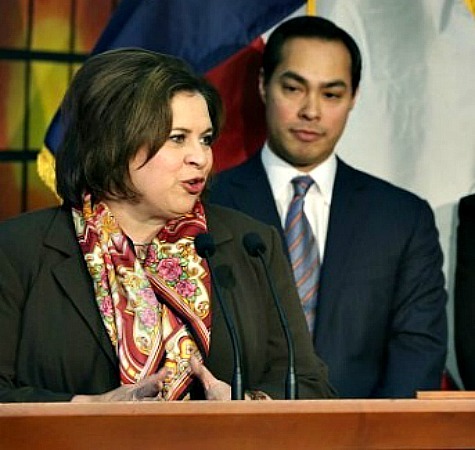 DALLAS, Texas — Senator Leticia Van de Putte (D-San Antonio), the liberal nominee for Texas Lt. Governor, wants to make college free for every student in Texas through a scholarship she calls the “Texas Promise.” This exceptionally generous program would pick up the tab for two-year public colleges and similar institutions by amending the state constitution and siphoning $2 billion from the state’s emergency coffers. Van de Putte unveiled this albatross at the 2014 Texas Democratic Convention and spoke in Tarrant County about it on August 14. The scholarship is intended to remove barriers students face in obtaining degrees and jobs, according to the Texas Tribune for a promise that is only “tuition free” for the lower rungs of higher public education — mainly community colleges and technical schools. This scholarship is meant for those students who do not qualify for existing state higher education grants or have not been awarded merit-based scholarships, according to Van de Putte who is ready to broker student loans with $2 billion in the state’s Economic Stabilization Fund (aka “Rainy Day Fund”) and hand out college-for-all cash. She arrived at this dollar amount benchmarking off of the 2013 measure Texas voters approved for water infrastructure projects, according to the Fort Worth Star-Telegram. “The Rainy Day Fund was never intended to be used to fund pet projects such as this political stunt,” JoAnn Fleming, Executive Director of Grassroots America and a leading voice in the constitutional conservative movement, told Breitbart Texas. “In November 1988, Texas voters approved the creation of the Rainy Day Fund with the explicit purpose stated on the ballot that the fund would be used to cover unforeseen shortfalls in revenue,” Fleming noted. She added that a provision of the law also gives the legislature opportunity to use the fund for other purposes such as for a budget shortfall. Interestingly, Van de Putte reframed the dismantling of the Rainy Day fund into “an opportunity” for Texans to set up the promise scholarship in a “one-time investment from existing funds to start the Texas Promise Fund” in the online scholarship page. She also insisted that the interest from this permanent fund, which is never called the Rainy Day or Emergency Fund, in the Texas Promise scholarship, would provide a sustainable source of revenue to cover the cost of this program. Speaking at a Tarrant County community college campus, Van de Putte went so far as to claim that there was upwards of $8.4 billion in the Rainy Day fund. “Every hard-working high school graduate in Texas deserves an opportunity to go to college, receive technical education and obtain post-high school credentials,” The Tribune also reported Van de Putte said. The “promise” may also mislead students seeking financial assistance because it is set up as a “last-dollar” scholarship. They cannot access this funding until after “proceeds from federal or state financial assistance are applied to the cost of tuition and required fees,” also according to the Texas Promise. Last dollar scholarships cover whatever is left out or left over. They must first apply for loans with the Free Application for Federal Student Aid (FAFSA), the Fed Led Ed college loan department, and acquire state and federal grant money for their two-year degree programs. Mrs. Obama also spoke to Texas high school students this Spring about her related “Reach Higher” initiative, the companion to the President’s North Star 2020 campaign. The goal is for America to have the highest proportion of college graduates in the world and be the leader in world-class education by the year 2020. Both programs route college prospects to the federal student loan department. It is no surprise that they do this either. The San Francisco Chronicle reported that the US Department of Education, which used to make “roughly a third of these loans through its direct lending program” began making 100 percent of them as of July 1, 2010 with the government takeover of the student college loan business. The inspiration for the “Texas Promise” is a nearly identical “Tennessee Promise,” entitlement program which CBS News reported as rolling out in 2015. It’s intention is to level the playing field at two-year community and technical college level. The Texas knock-off plan repackages Tennessee’s eight hour per semester community services requirement as work study. Van de Putte hopes for a 2016 rollout. The Tennessee Promise scholarship is funded out of their $34 million a year proceeds from the state lottery and not out of the state’s emergency account as Van de Putte has proposed in Texas, which can be a dangerous move in uncertain economic times. “Our legislature has dug enough holes. It’s time they started figuring out how to fill in the holes and not dig new ones,” Fleming commented, alluding to Van de Putte’s false promise. “With a state legislature whose leadership won’t get serious about spending limits and an unstable fiscal report card at the federal level, our state leaders should be having a discussion about what would happen if the 35% in federal funds ($69 billion) that make up our state budget revenue declined sharply or went away. That is a discussion worth having,” Fleming added. Phil King was the attack dog on raiding the Rainy day Fund, to stash 2 billion or so in to the hands of an “appointed” board ( ie-unaccountable) in a plan to steal our WATER. Craig Estes was a partner in crime on this, of course. Just as they were on stealing our land and highways by turning control over to private, foreign interest on the Toll Road scams. but hey……..it must be okay – they claim to LOVE JESUS, so what else matters ?